and other lesser players like CenturyLink , Digital Ocean, and VMware. As a result, they enable end users to run applications without all the messy compiling and configuring that applications usually require. Bitnami takes care of the libraries, language runtimes, and databases needed to make the applications work, providing a consistent, secure and optimized end-user experience when deploying any app, on any platform. Bitnami has a massive number of applications it supports (over 130) including WordPress, Magento, Joomla, Drupal, Moodle, SugarCRM, MediaWiki and PrestaShop among them. They provide the latest versions of your favorite applications and development stacks, tested and optimized for the deployment environment of your choice. Bitnami manages a claimed million application deployments a month and accounts for a significant share of total global cloud installs for a number of the applications it supports. Now headquartered in San Francisco, and with a development center in Seville, Bitnami has grown to scale without much fanfare, the absence of big name venture funding rounds has allowed them to focus on building their business rather than meeting the needs of their investors. 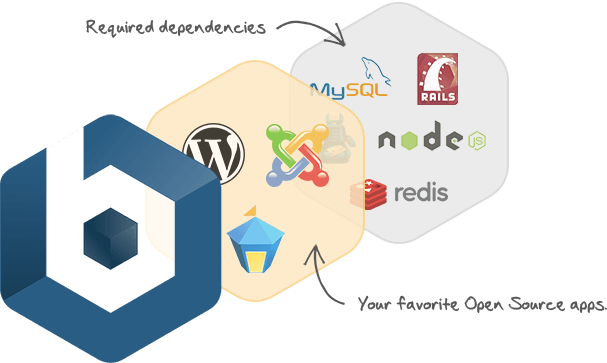 The Bitnami catalog continues to improve with infrastructure stacks such as WAMP, MAMP, LAMP and Ruby, as well as additional collaboration tools (like WordPress, Drupal, Ghost, and Roller we mentnioned). A few months ago it announced Docker images stocked with individual developer components such as NGINX, PHP, Ruby in SQL and noSQL varieties, while recently they announced expansion of their library to include commercially-licensed server software, in addition to the open source packages.